Portfolio of the Godsey: Ghosts Ghouls and Goblins, oh my! Ghosts Ghouls and Goblins, oh my! 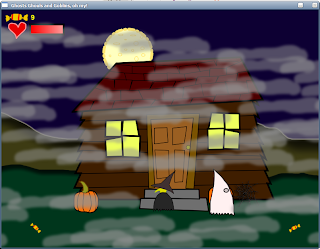 In leiu of Halloween I decided to make a simple two-day game about trick or treating. Once again I used Gosu, but for this I stuck with Ruby as the language. For Windows users who don't feel like figuring out how to get Ruby on their system I packaged the whole deal using RubyScript2exe which works fairly well. The game is pretty basic, you are a ghost going from house to house collecting candy. However, other trick or treaters will "attack" you. You can jump over them or throw candy to stun them and get by, but don't throw all of your candy! Controls are just arrow keys and space bar. You win by just lasting through to the end of the night (moon goes down).